In June 1812, Napoleon invaded Russia to compel Emperor Alexander I to remain in the Continental System. The Grande Armée, consisting of as many as 650,000 men (roughly half of whom were French, with the remainder coming from allies or subject areas), crossed the Neman River on 23 June 1812. Russia proclaimed a Patriotic War, while Napoleon proclaimed a "Second Polish War". But against the expectations of the Poles, who supplied almost 100,000 troops for the invasion force, and having in mind further negotiations with Russia, he avoided any concessions toward Poland. Russian forces fell back, destroying everything potentially of use to the invaders until giving battle at Borodino (7 September) where the two armies fought a devastating battle. Despite the fact that France won a tactical victory, the battle was inconclusive. Following the battle the Russians withdrew, thus opening the road to Moscow. By 14 September, the French had occupied Moscow but found the city practically empty. Alexander I (despite having almost lost the war by Western European standards) refused to capitulate, leaving the French in the abandoned city of Moscow with little food or shelter (large parts of Moscow had burned down) and winter approaching. In these circumstances, and with no clear path to victory, Napoleon was forced to withdraw from Moscow. So began the disastrous Great Retreat, during which the retreating army came under increasing pressure due to lack of food, desertions, and increasingly harsh winter weather, all while under continual attack by the Russian army led by Commander-in-Chief Mikhail Kutuzov, and other militias. Total losses of the Grand Army were at least 370,000 casualties as a result of fighting, starvation and the freezing weather conditions, and 200,000 captured. By November, only 27,000 fit soldiers re-crossed the Berezina River. Napoleon now left his army to return to Paris and prepare a defence of Poland against the advancing Russians. The situation was not as dire as it might at first have seemed; the Russians had also lost around 400,000 men and their army was similarly depleted. However, they had the advantage of shorter supply lines and were able to replenish their armies with greater speed than the French, especially because Napoleon's losses of cavalry and wagons were irreplaceable. On 9 January 1812, French troops occupied Swedish Pomerania to end the illegal trade with the United Kingdom from Sweden, which was in violation of the Continental System. Swedish estates were confiscated and Swedish officers and soldiers were taken as prisoners. In response, Sweden declared neutrality and signed the secret Treaty of Saint Petersburg with Russia against France and Denmark–Norway on 5 April. On 18 July, the Treaty of Örebro formally ended the wars between Britain and Sweden and Britain and Russia, forming an alliance between Russia, Britain, and Sweden. However, when Napoleon marched on Moscow in June–September 1812, neither Britain nor Sweden would give any military support to Russia, which was left on its own. The alliance existed only on paper. After the French Grande Armée retreated from Moscow on 18/19 October 1812 and suffered heavy casualties due to extreme cold, food shortages and repeated Russian attacks, Napoleon did not seem to be as invincible as before. On 14 December, the last French troops had left Russian soil, and Paris' allies were seriously considering rebellion and joining the Tsar's side. The Convention of Tauroggen was a truce signed 30 December 1812 at Tauroggen (now Tauragė, Lithuania), between Generalleutnant Ludwig Yorck von Wartenburg on behalf of his Prussian troops (who had been compelled to augment the Grande Armée during the invasion of Russia), and by General Hans Karl von Diebitsch of the Russian Army. According to the Treaty of Tilsit (9 July 1807), Prussia had to support Napoleon's invasion of Russia. This resulted in some Prussians leaving their army to avoid serving the French, like Carl von Clausewitz, who joined Russian service. When Yorck's immediate French superior Marshal MacDonald, retreated before the corps of Diebitsch, Yorck found himself isolated. As a soldier his duty was to break through, but as a Prussian patriot his position was more difficult. He had to judge whether the moment was favorable for starting a war of liberation; and, whatever might be the enthusiasm of his junior staff-officers, Yorck had no illusions as to the safety of his own head, and negotiated with Clausewitz. The Convention of Tauroggen armistice, signed by Diebitsch and Yorck, "neutralized" the Prussian corps without consent of their king. The news was received with the wildest enthusiasm in Prussia, but the Prussian Court dared not yet throw off the mask, and an order was despatched suspending Yorck from his command pending a court-martial. Diebitsch refused to let the bearer pass through his lines, and the general was finally absolved when the Treaty of Kalisch (28 February 1813) definitely ranged Prussia on the side of the Allies. Meanwhile, Austria's alliance with France ended in February 1813, and Austria then moved to a position of armed neutrality. It would not declare war on France until half a year later, in August 1813. On 3 March 1813, after the United Kingdom agreed to Swedish claims to Norway, Sweden entered an alliance with the United Kingdom and declared war against France. On 17 March, King Frederick William III of Prussia published a call to arms to his subjects, An Mein Volk, and declared war on France as well. The first armed conflict occurred on 5 April in the Battle of Möckern, where combined Prusso-Russian forces defeated French troops. Meanwhile, Napoleon withdrew some 20,000 troops from the ongoing Peninsular War to reinforce his position in Central Europe, which left his Iberian forces weakened and vulnerable to Anglo–Spanish–Portuguese attacks. On 17 March 1813, his brother King Joseph Bonaparte of Spain withdrew from Madrid, a clear sign of losing control. Wellington led a 123,000-strong army across northern Spain, taking Burgos in late May, and decisively defeating Jourdan at the Battle of Vitoria on 21 June. Marshal Soult failed to turn the tide in his large-scale Battle of the Pyrenees (25 July to 2 August). In June, the United Kingdom formally entered the coalition. Initially, Austria remained loyal to France, and foreign minister Metternich aimed to mediate a peace between France and its continental enemies, but it became apparent that the price was to be the dismantling of the Confederation of the Rhine and the return to France's pre-Revolutionary borders. Napoleon was not interested in any such compromise that would in effect end his empire, so Austria joined the allies and declared war on France in August 1813. Napoleon vowed that he would create a new army as large as that he had sent into Russia, and quickly built up his forces in the east from 30,000 to 130,000 and eventually to 400,000. Napoleon inflicted 40,000 casualties on the Allies at Lützen (near Leipzig, 2 May) and Bautzen (20–21 May 1813) but he himself lost about the same number of men during those encounters. Both battles involved total forces of over 250,000 – making them among the largest battles of the Napoleonic Wars to that point in time. The belligerents declared an armistice from 4 June 1813 which lasted until 13 August, during which time both sides attempted to recover from approximately quarter of a million losses since April. During this time Allied negotiations finally brought Austria out in open opposition to France (like Prussia, Austria had moved from nominal ally of France in 1812 to armed neutral in 1813). Two principal Austrian armies deployed in Bohemia and Northern Italy, adding 300,000 troops to the Allied armies. In total the Allies now had around 800,000 frontline troops in the German theatre, with a strategic reserve of 350,000. Napoleon succeeded in bringing the total imperial forces in the region up to around 650,000 (although only 250,000 were under his direct command, with another 120,000 under Nicolas Charles Oudinot and 30,000 under Davout). The Confederation of the Rhine furnished Napoleon with the bulk of the remainder of the forces, with Saxony and Bavaria as principal contributors. In addition, to the south, Murat's Kingdom of Naples and Eugène de Beauharnais's Kingdom of Italy had a combined total of 100,000 men under arms. In Spain an additional 150–200,000 French troops were being steadily beaten back by Spanish and British forces numbering around 150,000. Thus in total around 900,000 French troops were opposed in all theatres by somewhere around a million Allied troops (not including the strategic reserve being formed in Germany). Following the end of the armistice, Napoleon seemed to have regained the initiative at Dresden (26–27 August 1813), where he defeated a numerically-superior allied army and inflicted enormous casualties, while sustaining relatively few. However at about the same time Oudinot's thrust towards Berlin was beaten back, and the French sustained several defeats in the north at Großbeeren, Katzbach and Dennewitz. Napoleon himself, lacking reliable and numerous cavalry, was unable to fully take advantage of his victory, and could not avoid the destruction of a whole army corps at the Battle of Kulm (29–30 August 1813), further weakening his army. He withdrew with around 175,000 troops to Leipzig in Saxony where he thought he could fight a defensive action against the Allied armies converging on him. There, at the so-called Battle of Nations (16–19 October 1813) a French army, ultimately reinforced to 191,000, found itself faced by three Allied armies converging on it, ultimately totalling more than 430,000 troops. Over the following days the battle resulted in a defeat for Napoleon, who however was still able to manage a relatively orderly retreat westwards. However, as the French forces were pulling across the White Elster, the bridge was prematurely blown and 30,000 troops were stranded to be taken prisoner by the Allied forces. Napoleon defeated an army of his former ally Bavaria at the Battle of Hanau (30–31 October 1813) before pulling what was left of his forces back into France. Meanwhile, Davout's corps continued to hold out in its siege of Hamburg, where it became the last Imperial force east of the Rhine. The Allies offered peace terms in the Frankfurt proposals in November 1813. Napoleon would remain as Emperor of France, but it would be reduced to its "natural frontiers". That meant that France could retain control of Belgium, Savoy and the Rhineland (the west bank of the Rhine River), while giving up control of all the rest, including all of Poland, Spain and the Netherlands, and most of Italy and Germany. Metternich told Napoleon these were the best terms the Allies were likely to offer; after further victories, the terms would be harsher and harsher. Metternich aimed to maintain France as a balance against Russian threats, while ending the highly destabilizing series of wars. Napoleon, expecting to win the war, delayed too long and lost this opportunity; by December the Allies had withdrawn the offer. When his back was to the wall in 1814 he tried to reopen peace negotiations on the basis of accepting the Frankfurt proposals. The Allies now had new, harsher terms that included the retreat of France to its 1791 boundaries, which meant the loss of Belgium. Napoleon adamantly refused. In December 1813, the Swedish army attacked Danish troops in Holstein. General Anders Skjöldebrand defeated the Danes at Bornhöved on 7 December 1813. Three days later, the Danish Auxiliary Corps scored a victory at Sehested. However, the Danish victory could not change the course of war. On 14 January 1814, the Treaty of Kiel was concluded between Sweden and Denmark–Norway. By the terms of the treaty, Norway was to be ceded to the king of Sweden. However, the Norwegians rejected this, declaring independence and adopting their own constitution on 17 May. On 27 July, Swedish forces invaded Norway. After a short war, an armistice (the Convention of Moss) was concluded on 14 August. Norway agreed to enter into a personal union with Sweden as a separate state with its own constitution and institutions, except for the common king and foreign service. The Union between Sweden and Norway was formally established on 4 November 1814, when the Parliament of Norway adopted the necessary constitutional amendments, and elected Charles XIII of Sweden as king of Norway. All the participants of the War of the Sixth Coalition. Blue: The Coalition and their colonies and allies. Red: The First French Empire, its protectorates, colonies and allies in January 1813. While events unfolded in the East, the Peninsular War in Iberia continued to be Napoleon's "Spanish ulcer" tying down hundreds of thousands of French soldiers. 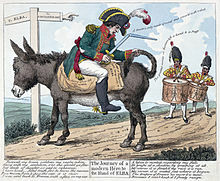 In 1813, Arthur Wellesley, Duke of Wellington, finally broke the French power in Spain and forced the French to retreat. In a strategic move, Wellington planned to move his supply base from Lisbon to Santander. The Anglo-Portuguese forces swept northwards in late May and seized Burgos; they then outflanked the French army, forcing Joseph Bonaparte into the valley of the River Zadorra. At the Battle of Vitoria, 21 June, the 65,000 French under Joseph were routed by 53,000 British, 27,000 Portuguese and 19,000 Spaniards. Wellington pursued and dislodged the French from San Sebastián, which was sacked and burnt. The allies chased the retreating French, reaching the Pyrenees in early July. Marshal Soult was given command of the French forces and began a counter-offensive, dealing the allied generals two sharp defeats at the Battle of Maya and the Battle of Roncesvalles. Yet, he was put again onto the defensive by the British army and its Portuguese allies, lost momentum, and finally fled after the allied victory at the Battle of Sorauren (28 and 30 July). In the Battle of the Pyrenees Wellington fought far from his supply line but won with a mixture of manoeuvre, shock and persistent hounding of the French forces. On 7 October, after Wellington received news of the reopening of hostilities in Germany, the Coalition allies finally crossed into France, fording the Bidasoa river. On 11 December, a beleaguered and desperate Napoleon agreed to a separate peace with Spain under the Treaty of Valençay, under which he would release and recognize Ferdinand VII as King of Spain in exchange for a complete cessation of hostilities. But the Spanish had no intention of trusting Napoleon, and the fighting continued on into France. After retreating from Germany, Napoleon fought a series of battles, including the Battle of Arcis-sur-Aube, in France, but was steadily forced back against overwhelming odds. During the campaign he had issued a decree for 900,000 fresh conscripts, but only a fraction of these were ever raised. In early February Napoleon fought his Six Days' Campaign, in which he won multiple battles against numerically superior enemy forces marching on Paris. However, he fielded less than 80,000 soldiers during this entire campaign against a Coalition force of between 370,000 and 405,000 engaged in the campaign. [note 3] At the Treaty of Chaumont (9 March) the Allies agreed to preserve the Coalition until Napoleon's total defeat. The Allies entered Paris on 30 March 1814 after a short battle. Napoleon was determined to fight on, proposing to march on Paris. His soldiers and regimental officers were eager to fight on. But Napoleon's marshals and senior officers mutinied. On 4 April, Napoleon was confronted by his marshals and senior officers, led by Ney. They told the Emperor that they refused to march. Napoleon asserted that the army would follow him. Ney replied, "The army will follow its chiefs". Napoleon abdicated on 11 April 1814 and the war officially ended soon after, although some fighting continued until May. The Treaty of Fontainebleau was signed on 11 April 1814 between the continental powers and Napoleon, followed by the Treaty of Paris on 30 May 1814 between France and the Great Powers including Britain. The victors exiled Napoleon to the island of Elba, and restored the Bourbon monarchy in the person of Louis XVIII. The Allied leaders attended Peace Celebrations in England in June, before progressing to the Congress of Vienna (between September 1814 and June 1815), which was held to redraw the map of Europe. ^ There was one last bloody engagement in south-west France, when. under the orders of Thouvenot, the French sortied from Toulouse and fought the Battle of Bayonne (14 April 1814). ^ Hodgson gives no size for the Army of the North but estimates the Austrian Grand Army have 10,000 and the Army of Silesia 25,000 more men than Maud. ^ Palmer, Alan (1972). Metternich: Councillor of Europe (1997 reprint ed. ), p. 86–92. London: Orion. ISBN 978-1-85799-868-9. ^ Ross 1969, pp. 342–344. ^ Robinson 1911, p. 97. ^ a b Maude 1911, p. 232. ^ Hodgson 1841, p. 504.